2019 Complete Bikes Now Online! 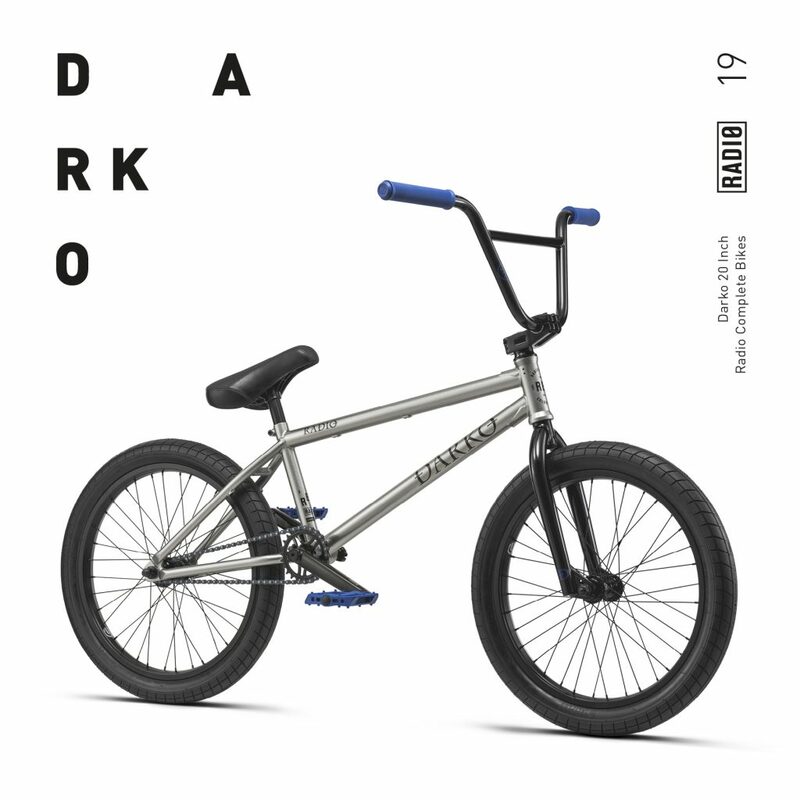 12 Oct2019 Complete Bikes Now Online! Welcome to the 2019 Radio Bikes complete bike line! 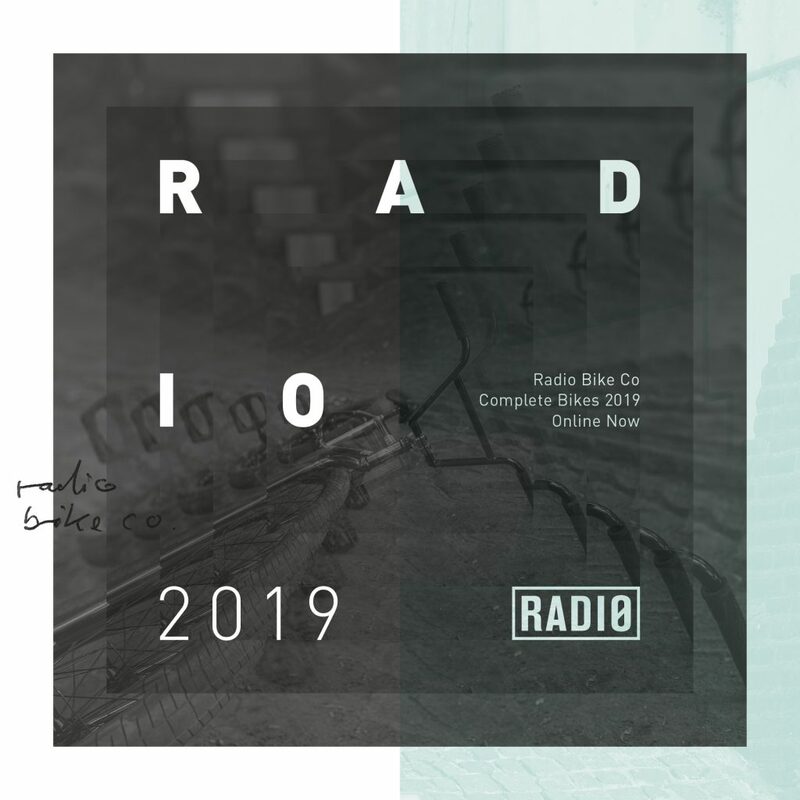 RADIO BIKES kicks off 2019 in style – right off the back of another successful and progressive year. Backed by a full international PRO team with some of the best riders in the world including USA’s Brian Fox and the UK’s Jack Clark – RADIO as a brand has never been more active and present around the globe. With the addition of our new Radio Raceline line of Race specific models, the Radio Bikes lineup has never been a more complete collection of the bikes that riders want and need. You will instantly recognize a full revamp of our complete bike line, including new colors, parts and brand new features packed into some truly exceptional and unique bikes. We spent much of last year connecting with our key shops and distributors worldwide, taking in their valuable feedback to then input and introduce a healthy injection of brand new designs to the equation, resulting in an incredible offering of complete bikes that may break the mold but definitely not the bank. 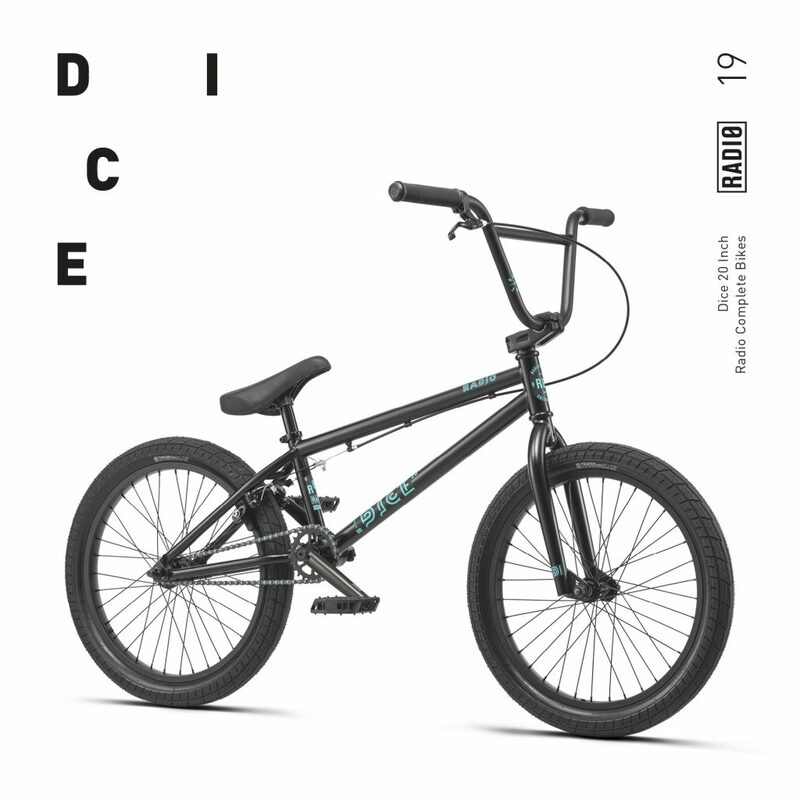 The 2019 line begins with the Dice, a rider’s first step into the world of BMX and available in three wheel sizes (16”, 18” and 20”) ensuring that their first BMX bike fits like a glove. A huge improvement for 2019 is the new 9t cassette hub which now comes spec’d on the 20” and FS version of the Dice, bringing micro-drive gearing down to an even lower price point. As always we packed this year’s line with all the latest aftermarket components from Salt and Saltplus as well a selection of our own new aftermarket parts for the upcoming season. Some of the highlights include the new high-rise Salt ZION stem, super grippy Saltplus BURN tires and our new slim profile Radio PRO pedal and now – the Leon Hoppe signature 47 Guard Sprocket on the Comrad. With so many jaw dropping bikes in this year’s lineup, you’ll be hard pressed to find a line of complete bikes that offers the variety of colors, finishes, geometry and components as Radio Bikes does in 2019. The do-it-all Evol now comes in a vivid Metallic Matt Red color that is perfectly partnered by the Matt Metallic Lime on the 18” and 20” Saiko bikes. We really pushed the boat out this year to ensure that every bike has it’s own separate identity and story. 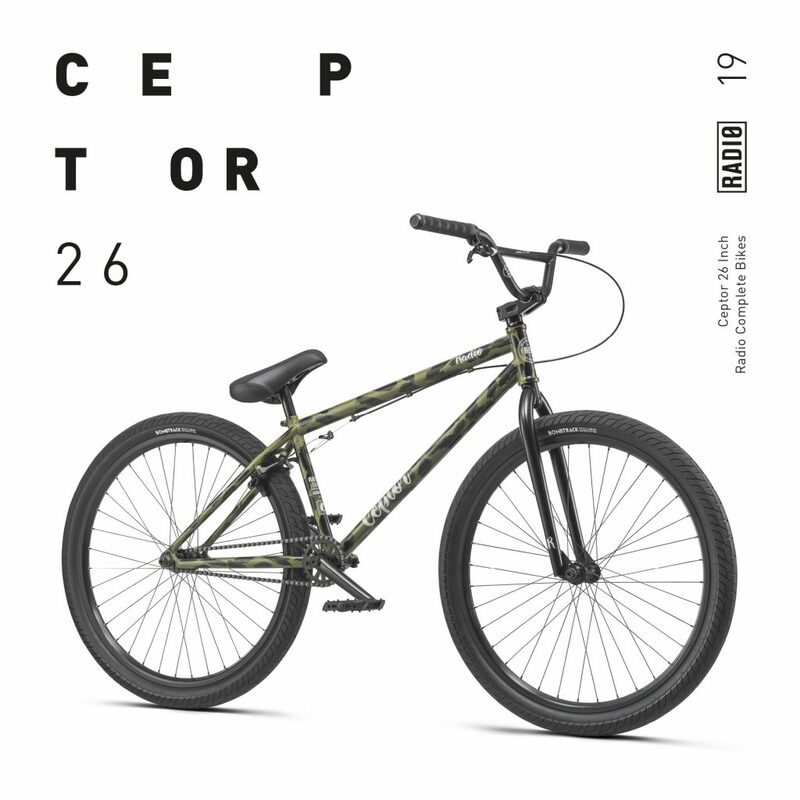 Key examples of this are the mystical Cyan/Purple fade on the Valac street machine, and the military-inspired Green Patina on the Ceptor 26” cruiser. Please take your time as you go through the Radio 2019 line, we couldn’t be more proud of how far our bikes have come over the past 9 years – and we truly believe that this is our most progressive line to date… All 2019 complete bikes are available now worldwide. For more info on where to find your nearest Radio Bikes dealer, please contact the Radio Bikes distributor in your country.